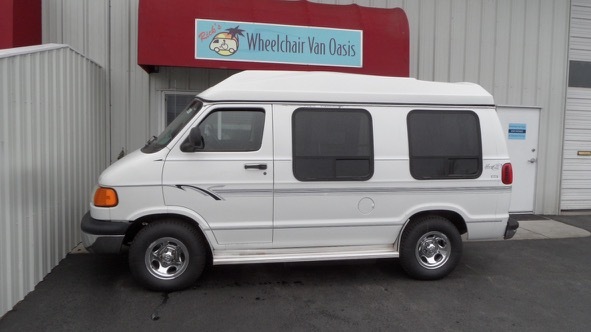 * Short body wheelchair vans are super rare and are desirable because they are easier to park and maneuver...and they look kinda cute! Ford and Dodge quit making short length vans in the early 90's and Dodge stopped in 2005. As for wheelchair vans, very few short length vans were converted into W/C vans. Yes, this van is special. This began as a rare and desirable short body (same length as a minivan!) half ton, 1500 series. Has a large 6 cylinder (3.9 liter) and automatic. Before the fancy conversion described below, it included a nice list of features such as: power windows, locks and mirrors; tilt and cruise; stereo; etc. * Moderately tall doors and corresponding roof notch: this creates the extra entry clearance, which some folks must have. For folks in wheelchairs, who don't absolutely require it, because they can duck, slouch, lean or tilt as they enter...its still a nice feature to have as it makes going in and out easier. Plus, it makes access/egress for able- bodied folks much nicer as well. 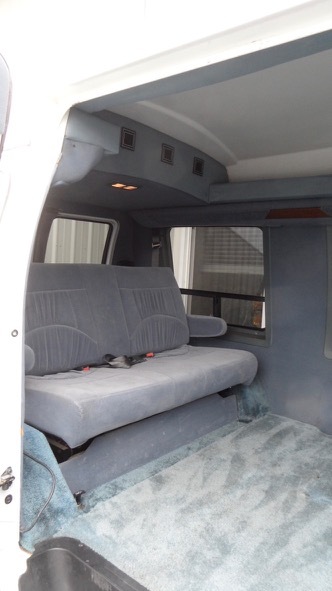 * Special custom floor: NEW: this will have one of my favorite improvements on wheelchair vans, which is very helpful to the person in the wheelchair and able-bodied folks as well. 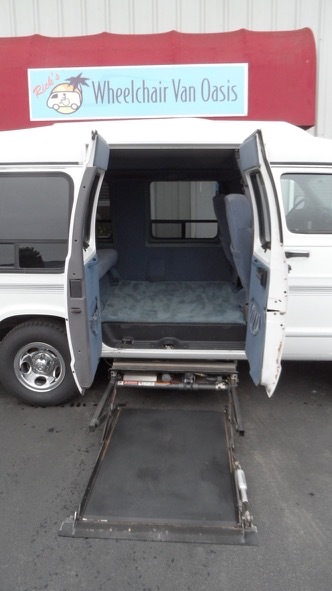 I actually consider this feature to be an improvement that most wheelchair vans ought to have, old or new. 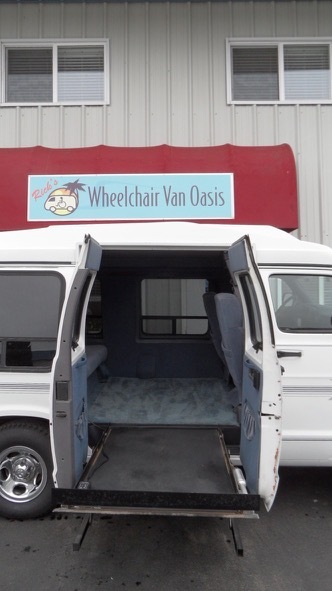 You see, if you pay close attention to how floors typically are in personal use wheelchair vans, you will notice that they are usually not actually solid, smooth and level. Rather, they are somewhat lumpy, bumpy and not as easy to maneuver a wheelchair on as they can be. 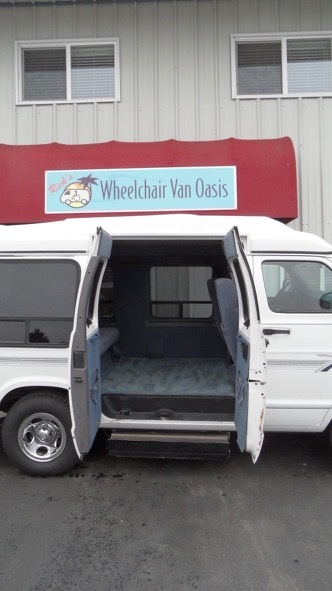 This is because the factory metal floor of a van is not actually smooth, it has ridges and contours...plus has a carpet pad which wheelchair wheels sink into a bit, creating resistance to maneuvering. Based on my specifications and design, we greatly improve the original floor treatment by removing the existing carpet and pad and then installing a sheet of wood directly over the lumpy, bumpy, contoured metal floor. And thus, it became a smooth, solid, level floor. And then a fantastic type of commercial rubber-like flooring will be used to cover the wood. This material is tough, and easy to clean. 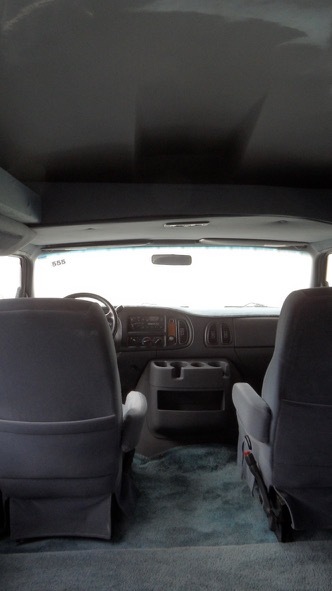 This van will have this new flooring package, which notably improves the interior use of the van. Most importantly, it is a super surface to maneuver a wheelchair on. * Floor anchors: has multiple locations of slots in the floor that anchor straps can be inserted into. Includes four, quality anchor straps. 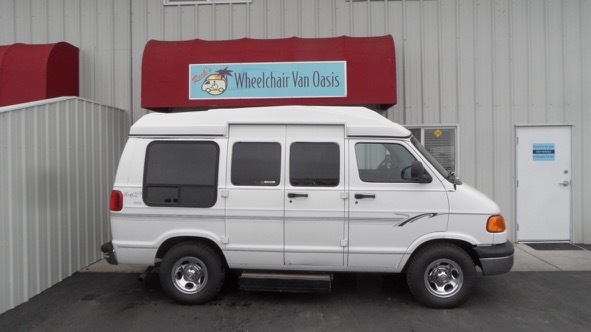 It is true that this van is not super modern, but considering this classic Dodge body style (nearly same from early-90â€™s, until mid-2000â€™s) and very desirable tall doors and rare (only apx 10% of vans have this model lift, because itâ€™s nearly double cost of common lifts) model of lift that most folks love, and top it off with wonderfully low milesâ€¦.this is an awesome van! And another nice and rare bonus is that it is the short body, which literally is the same length as most modern minivans. Super van, affordable price. Finallyâ€¦.it will be in our usual high-level of â€œCertifiedâ€™ condition, cosmetically and functionally, with warranty. Each of our vans receives this treatment, regardless of the price. NOTE: I am always searching for more vans which are a nice addition to the mix of vans we have to offer. I will post initial information here about each van as I purchase, transform, and then make them available for sale. From the time I purchase a van until my transformation process is completed, averages approximately 4-6 weeks.